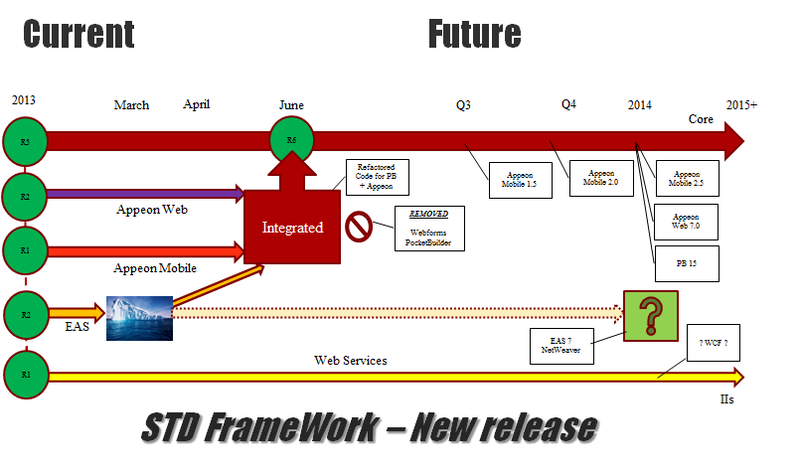 Great White North Technical Evangelist: PB Classic Integrated Framework - V5.3.0.14 (SP3) Released! Integrated Foundation Classes ( Service Pack #3) Released! "THE" PB Classic & Appeon Framework! Software Tool & Die Inc (STD) is very pleased to announce that they have just released an updated version (5.3.0.14) of their Integrated Foundation Class library for PowerBuilder "Classic", Appeon Web and Appeon Mobile! The latest version contains the following updates and has been tested with Appeon 2013R2 build 0138 using the official MR (maintenance releases) of PowerBuilder "Classic". Testing inside of PB included Win32 (both p-code & m-code) deployments while testing inside of Appeon included Web (IE10/11 - 32 & 64bit) , latest Apple Tablet/Smart Phone and Android Tablet/Smart Phone deployments. Corrected RHMB script on base DataWindow control to display the pop-up menu properly at the mouse pointer location when the parent Window is of type "Response". Added "Centering" logic to the base CHILD window "wn_child_master" to center off the "Controller" window when active. Fixed a BUG in the Tab Page base ancestor "nc_tp_master" that fired the "oe_postconstructor" event twice! Revised the centering logic on the base RESPONSE window "wn_response_master" to optimize the behaviour. Added "Centering" logic to the base POPUP window "wn_popup_master" to center off the "Controller" window when active. Added window "registration" logic to the base CHILD window "wn_child_master" to allow the Controller to track its resources. Fixed the base ancestor MAIN window "wn_main_master" to correct a register/Unregister issue with the active "Controller" window. Fixed the base ancestor CHILD window "wn_child_master" to correct a register/Unregister issue with the active "Controller" window. Fixed the base ancestor POPUP window "wn_popup_master" to correct a register/Unregister issue with the active "Controller" window. Added "parent" object registration to all STANDARD NON-VISUAL objects via an "of_register" method! Fixed a formatting bug in the SQL trace of the TRANSACTION and DATASTORE base ancestor objects. Added default Boolean, long and Integer instance work variables to all STANDARD NON-VISUAL objects. Added error event logging to the web service CONNECTION object base ancestor (ns_connection_master). Revised PB version checking to be INI driven versus hard coded. Added new "PB_Version=" parameter to the base INI file & related code in the supporting classes. Added a new "of_is_copy" method to the base transaction object (ns_transaction_master). 1) Tune the PB, Appeon Web and Appeon Mobile single source framework. 2) Add more PB, Web and Mobile features. 3) Integrate Open Source tools like Spell Checking, OCR, Imaging and more! Note: There will be BETA release of the FC's coming soon after Appeon 7.0 beta is released that supports multiple web browsers ... Please stay tuned to this blog for more news releases!